The GrayFace MM8 Patch fixes many gameplay bugs, while adding optional new features. Install the GrayFace MM8 Patch. Run the game to generate mm8.ini. Save your changes. 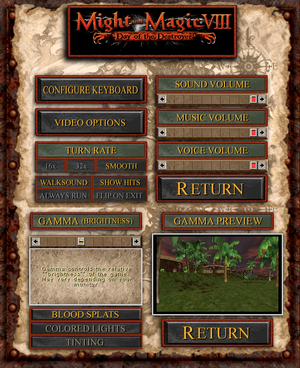 The game will now go directly to the main menu. Open mm8.ini and ensure NoCD= is set to NoCD=1. This disables CD music; to use MP3 music instead see No music (GrayFace MM8 Patch). Toggle with F4; needs 16-bit color unless using the GrayFace MM8 Patch. avalaible on gog or use French translation. 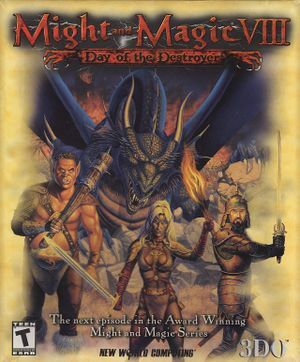 Use Might & Magic 8 (GOG) - Deutscher Sprachpatch. Using the GrayFace MM8 Patch with the NoCD option stops music playing so you will need to use MP3s instead. Rename them to 2.mp3 through 15.mp3. OpenMM8 is an open source reimplementation using the Unity engine. This project is incomplete.